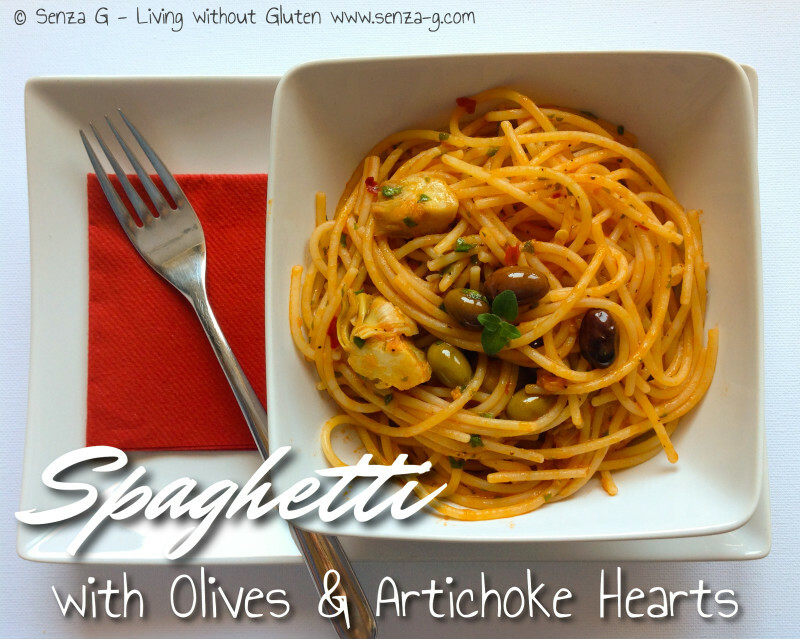 Ever feel like a delicious and simple pasta which does not involve too much time and work? This is the perfect recipe! It is made with Taggiasca Olives, olives of a small size and of elliptical shape, which have a sweet, fruity but mild flavor and with a coloring that varies between blond and deep red. If you do not find Taggiasca olives, substitute with other small black olives. Heat oil in a pan over medium heat and sauté the garlic. Do not let it brown as it will make the sauce bitter. Lower the heat, and add the crushed tomatoes, the tomato puree, pinch sugar, the Chilli, if using, and combine well. Cook for a couple minutes and then add the olives and the artichokes, the oregano and the chopped parsley. In the meantime, boil the spaghetti and when al dente, drain and toss gently with the sauce. Drizzle with a little extra olive oil if desired and serve.